More than 20 years ago, I watched my first video camera go belly up in the Guadalupe River. We were canoeing down a particularly nasty stretch of the river with the camera stowed in an aluminum case in the center of the canoe. We got sideways in the current, the canoe flipped, and the camera box went downstream. The box bobbed in the current for a minute or two and then slipped below the surface. We retrieved the box further down the river… all 25 soaking pounds of it. Water poured out when I opened the lid. It wasn’t pretty. As an insolvent college student who really shouldn’t have spent the money on that camera in the first place, it was a hard lesson. But waterproofing technology has come a long way in 20 years. These days, waterproof cameras and waterproof cases are better built, more widely available, and more affordable than ever before. That’s great news for anglers and outdoorsmen who want to take their cameras on the water without an eminent fear of ruining them. This month we’ll take a look at a few cool waterproof cameras and waterproof cases designed to handle the rigors of the rugged and wet outdoors. Not long ago, photos taken with the lowly cell phone were pretty crappy. But manufacturers have continually improved the onboard cameras in these devices and many are now quite good. When you consider the option of editing photos within the phone and the ability to instantly send the photos electronically, the modern cell phone becomes a strong player in the camera world. One inherent problem, though, with using phones on the water is the very real fear they’ll get wet, ruining the phone and all its contents. It’s a significant deterrent. But, if you happen to own an iPhone there is a solution. It’s called the Lifeproof case. The Lifeproof case for the iPhone protects the phone from water, snow, dirt, and shock (what the company calls the “4 Proofs”). Not only does the Lifeproof case provide a solid protective covering, it also allows the phone to remain fully functional. You can make calls, take photos, and operate the touchscreen normally while the phone is inside the case. The Lifeproof case is slim and unobtrusive and the build quality seems reasonably good, offering protection against water intrusion to a depth of 6 feet. I have been using a Lifeproof case for several months and it has performed as advertised. My only complaint is that the case seems to slightly muffle sounds coming and going through the phone. This makes it a little tough to hear callers and for them to hear you in windy conditions or when there is a lot of background noise. But, if you frequently carry your iPhone into wet locations it’s a fair trade. 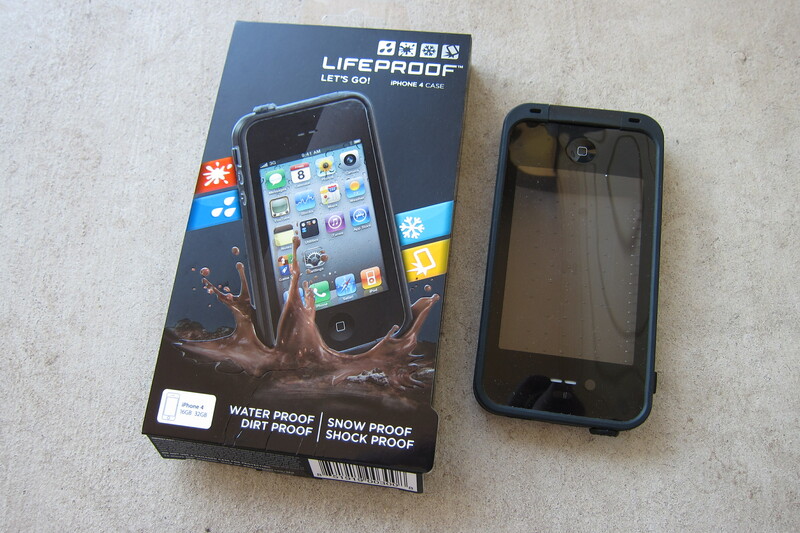 The Lifeproof case for the iPhone sells for $69.95. Waterproof point and shoot digital cameras have been around for nearly 10 years and have become widely popular. Most of these cameras have solid plastic or metal bodies to protect against impact and access ports outfitted with O-rings or neoprene gaskets to protect against water intrusion. Generally speaking, these cameras are built to withstand dust, dirt, freezing temperatures, impacts from 6-foot drops, and water intrusion to depths of around 30 feet. New waterproof point and shoot cameras come out each year and it’s easy to get lost in the details and specifications when comparing them, as nearly all major camera manufacturers offer a waterproof model in their point-and-shoot line. I am not going to try to cover every waterproof camera on the market, but I’ll mention two very good ones- The Canon Powershot D10, and the Olympus Stylus Tough-8010. Both cameras offer similar protection against drops, freezing weather, and water intrusion. The Olympus Stylus Tough-8010 takes it one step farther and is crush-proof to220 lbs. The Stylus is also slimmer than the Powershot and records 720 HD video, while the plump little Powershot only records video in standard definition. The photo quality in both cameras is good, but the Powershot is slightly better than the Stylus, with sharper images and more vivid colors. I have also found the buttons and controls on the Powershot easier to manipulate on the water or while wearing gloves. Overall you really can’t go wrong with either of these proven high-quality waterproof cameras. 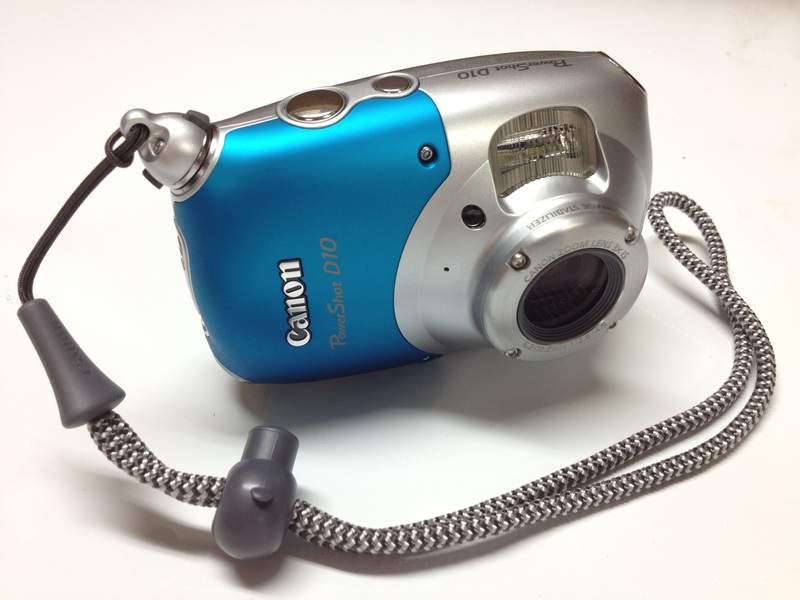 The Olympus Stylus Tough-8010 sells for around $250.00 and the Canon Powershot D10 sells for $299.00. I have owned a few different compact waterproof video cameras over the years and have been pleased with the performance of most of them. But hands-down, my favorite is the GoPro HD Hero video camera. This camera is seriously cool. The GoPro HD is housed in a small but virtually indestructible waterproof polycarbonate housing that can be clamped, strapped, or suctioned to nearly anything. The housing is waterproof to over 100 ft. and can withstand high drops and high-speed crashes. A selection of adapter mounts is included with the GoPro HD Hero camera and mounts are also sold individually. The GoPro Hero HD will record 1080p HD video at 30 frames per second and 720p HD video at 60 frames per second. The resolution and color saturation of recorded HD video is very good and the overall quality rivals any other compact HD video camera I have seen. The GoPro HD also records still photos at a resolution of 5 megapixels and can be programed to snap photos automatically at 2, 5, 10, 30, and 60 second intervals. 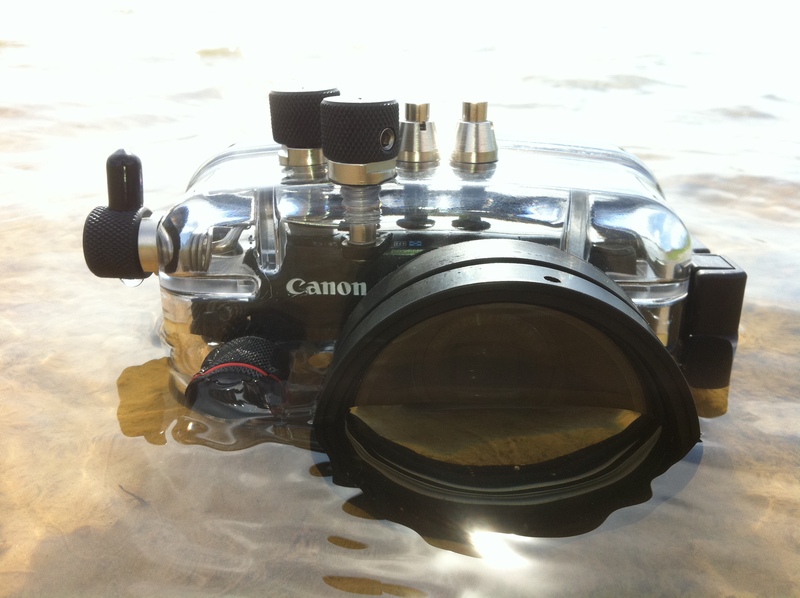 The GoPro HD housing is equipped with a super wide angle lens and it captures a lot of real estate (170 deg on 720p and 127 deg on 1080p). 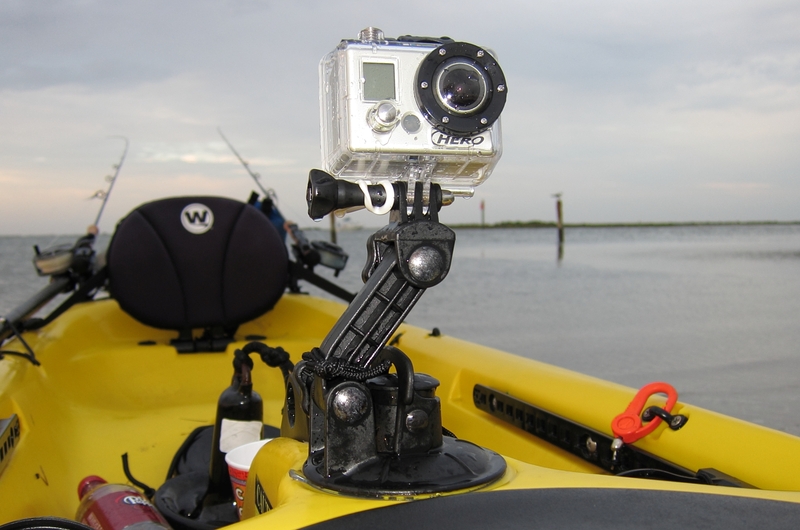 This lens also has the inherent effect of “absorbing” camera-shake, so even under very rough conditions video lacks that disturbing “shakiness.” The GoPro HD Hero is a perfect camera to mount to your kayak or to the console of your boat. It’s available in several different packages and is priced around $299.00. If you want the absolute best waterproofing protection for your camera equipment, consider looking at Ikelite’s line of waterproof housings. 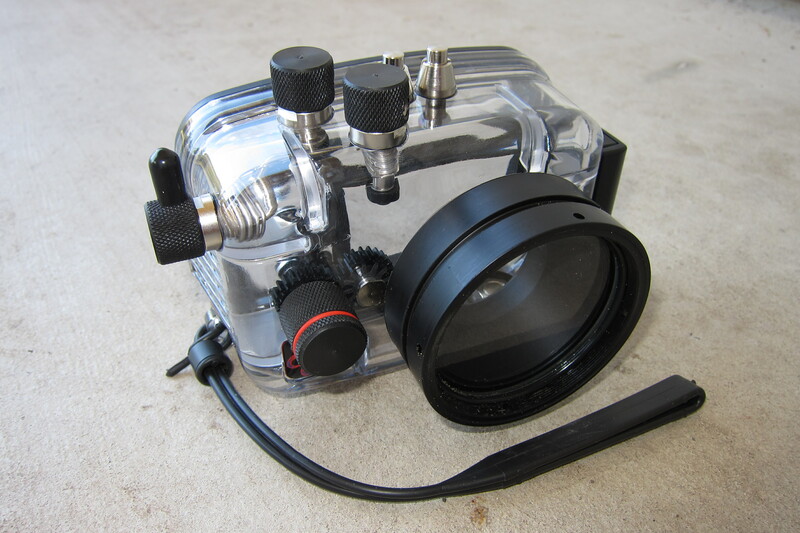 Ikelite manufactures top of the line housings for a wide array of compact and SLR cameras- think “Jacques Cousteau” here. These housings are exceedingly well built and rated for use at depths of well over100 ft. Ikelite also makes strobes and a variety of other accessories to go with their camera housings. Ikelite housings start at around $300.00. When it comes to waterproof cameras and housings, the reality is that most failures are due to user error or lack of maintenance. Seals and fittings will fail if they are not properly cared for, and manufacturers will almost never cover the cost of your camera if their housing fails. Sad but true. With that in mind, no matter which waterproof camera or camera housing you use, make absolutely sure you follow the manufactures operating, care, and maintenance procedures. This will help keep your equipment safe and sound for the long haul.